If you cook a lot, your oven becomes greasy, and there is no way to escape this. Even if you wipe the dirt off it every time you prepare a meal, the dirt will still get into gaps and in places that are hard to reach. Also, only super humans clean their ovens every time they cook. We all slack sometimes and leave our cookers nasty. 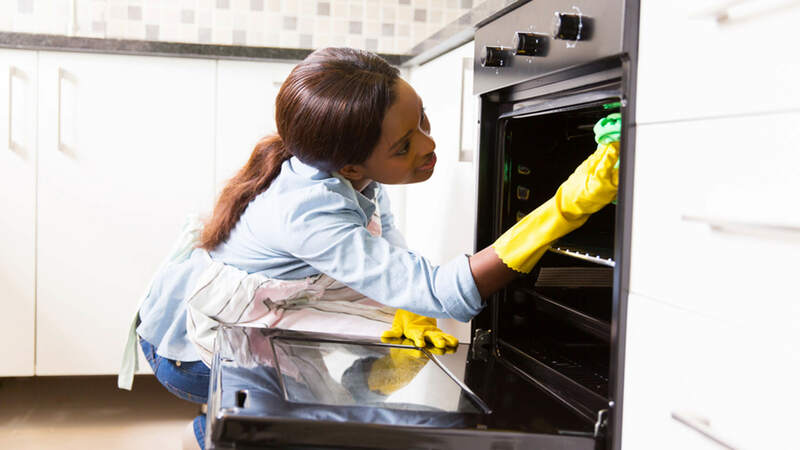 So here are several pieces of advice that will help you to go through the oven cleaning like a champ. And we’re going to be using natural cleaning products. Sure, chemicals can make the process easier and faster. But is the harm they do worth a bit of saved time? Products we can find in shops can cause various health issues starting with a simple allergy and ending with severe problems with lungs and skin. If you look closely on what is written on the label, manufacturers often suggest using their products with gloves and even a respirator on. Can this product be safe? We doubt that. There are a lot of more natural ingredients that can be as effective as the ones that are sold in the store. They are less harsh and won’t cause any damage to your health. But still, it is better to do the oven cleaning with rubber gloves on. Remove racks and other parts that you can take off the oven and put them into warm water mixed with dish soap. You can soak them in the solution up to several hours – it is better to do overnight. Or leave them in water in the morning, and you will have a clean rack in the evening. As we cook, a lot of grease and dirt accumulates on racks. Trying to scrub it off you can spend a lot of time. But if you soak pieces in the solution first, the grease will dissolve or at least become soft. And you can get rid of leftovers using a sponge. Then rinse the racks and let them dry. Mix baking soda with dish soap and some water if the soap is too thick. Cover all surfaces in the inside thoroughly, gently scrubbing them. The paste will become brown as you apply it on dirty spots. You can leave the baking soda paste on surfaces overnight. Give it 12 or even more hours to dissolve all the grease. After the needed time passes, start removing the paste. If the soda got too solid, you could use a spatula to scrape it off. Or just spray it with white vinegar, enjoy the bubbly reaction and then wipe it off. It will look like an ad of a high-quality cleaning product – as you wipe away baking soda, you see a perfectly clean surface underneath it. Hobs can be a pain, especially if you have a gas cooker. In this case, you will have some food stuck in holes. You should take off all the parts of the hob, clean them and let them dry. You can utilize a brush to take off all the dirt more efficiently. The baking soda paste will work here as well, so you can use it without hesitation. Then use the dry brush to clean all the burnt food from holes in the hob. 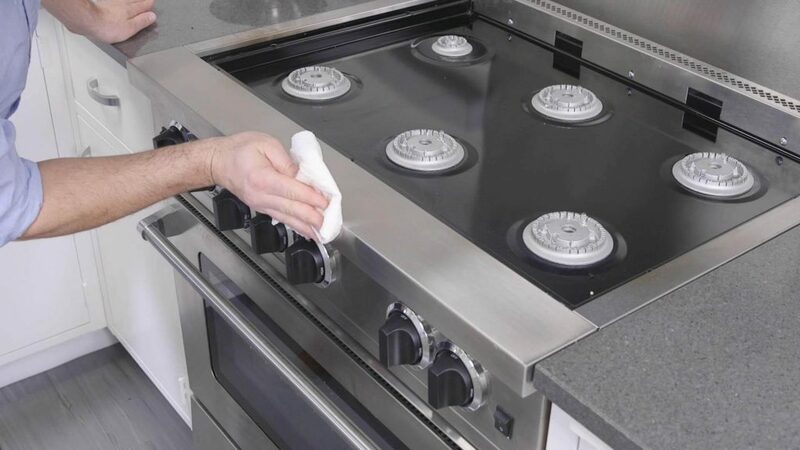 It is really important to clean them thoroughly – if something is stuck in them, the hob will not work properly. Don’t let the liquid get inside! The surface around hobs is easy to clean with the same old baking soda paste and vinegar. Usually, the outside part of the cooker is not as dirty as the inside, so you don’t have to leave the paste overnight. Although, if the oven is really greasy, you can cover both inside and outside parts with soda and leave it to sit. It is a hassle to clean switches. You can use a toothbrush if they are filthy. Or you can just wipe them with a sponge soaked in vinegar. It is really easy to make your oven sparkly clean without expensive and dangerous chemicals. You just need to be a bit more patient and let natural ingredients do their job. It doesn’t require much more effort that cleaning with store-bought products.